I cannot seem to install the correct boot loader for a non-UEFI firmware system. I'm trying to install Ubuntu 12.04 and Windows 7 (64) which are technically compatible with GPT but for windows only if the firmware is UEFI enabled. My system uses the old BIOS system and does not support UEFI. Therefore, whenever I finish my Ubuntu install and try to install Windows I get a "cannot install to GPT partition type" error. Even if I use Gparted to format a special NTFS file format for windows it can't handle the GPT partition style because it doesn't have UEFI. But my ubuntu install always forces GPT during installation and never asks if I want to install the old BIOS style MBR instead. How do I resolve this? Both OS's will install fine on their own the problem is when I try to install the second OS it doesn't recognize any of the other's partitions and tries to rewrite it's own on top of the other. I've tried both OS's first and always run into the same problem. Since there is no way to make Windows recognize GPT without upgrading my Motherboard how do I tell Ubuntu to use the old BIOS MBR on install? Do I have to download a special Ubuntu with a specific grub version? or should I manaually configure my partition somehow to force it not to use GPT? You are making a mistake somewhere. The LiveCD does NOT use grub as a bootloader, it uses Syslinux. Press F6, go down to nomodeset, and press Enter. You will see an X next to it. 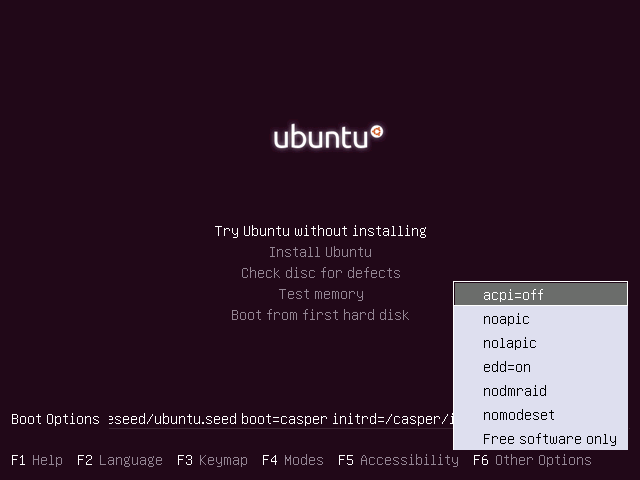 Then press Esc, and "Try Ubuntu"
If the above doesn't work, repeat steps 1-2, but press F6 and then Esc to see the command-line. There, replace quiet splash with nomodeset and press Enter. The first thing you should do is install Windows: During the installation, use the Windows CD to create a partition for windows and leave some unpartitioned / free space for Linux. For example, on a 500GB HD, you could use 100 GB for a first windows partition and leave 400G of unpartitioned space. According to what you said about your mother board, using the Windows CD to partition will automatically create an MBR partition. After Windows is installed and working, boot with the Ubuntu CD and use GParted to create the necessary partition to receive Ubuntu. Ubuntu (like Debian), can be installed in both kinds of partitioning systems, GPT and MBR. So no problem, just use GParted to add another partition. But pay attention not to touch the already created first partition (the one you created during the Windows install). For example you could create an second partition type ext3 of 100G for your Ubuntu install, (there should remain 300GB of unpartitioned space on the disk). 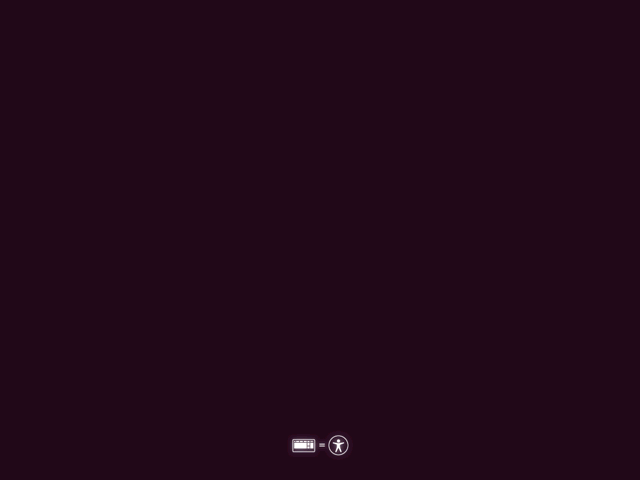 And go on with the Ubuntu install. If you do everything correctly you will end with a dual boot HD install (Windows/Ubuntu). Good luck! Not the answer you're looking for? Browse other questions tagged grub2 dual-boot uefi gpt or ask your own question. Can I install Windows after installing Ubuntu on UEFI?